Back in July 2010, DirecTV rescued Damages from being cancelled after FX announced that they wouldn’t be airing it any longer. The Glenn Close series was renewed for two seasons of 10 episodes each and at that time we suspected that would be the end of the show. DirecTV has now announced that season five will indeed be the end. The last 10 episodes of Damages will debut on DirecTV on July 11th and will likely run through September 12th. Season four, which ran last summer, is being released on DVD on June 26th . DAMAGES Fifth and Final Season Heads Toward an Explosive Showdown This SummerIn true DAMAGES fashion, the season features a stellar array of stars including Ryan Phillippe, who joins the cast as a series regular. Emmy Award-nominee Jenna Elfman, Academy Award-nominee Janet McTeer, John Hannah, Chris Messina, Judd Hirsch, M. Emmett Walsh, Victor Garber, William Sadler, Gbenga Akinnagbe, Gillian Alexy and Zachary Booth will be featured throughout the season. 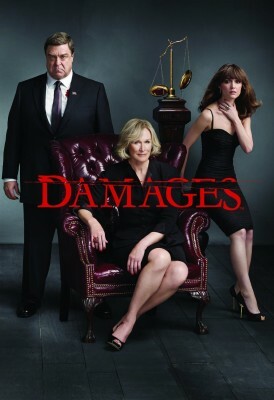 DAMAGES was created and executive produced by KZK (Todd A. Kessler, Daniel Zelman and Glenn Kessler) and co-executive produced by Mark A. Baker. DirecTV (NASDAQ:DTV) is one of the world’s leading providers of digital television entertainment services delivering a premium video experience through state-of-the-art technology, unmatched programming and industry leading customer service to 32 million customers in the U.S. and Latin America. In the U.S., DirecTV offers its 19.9 million customers access to more than 170 HD channels and Dolby-Digital(R) 5.1 theater-quality sound, access to exclusive sports programming such as NFL SUNDAY TICKET(TM), Emmy- award winning technology and higher customer satisfaction than the leading cable companies for 11 years running. DirecTV Latin America, through its subsidiaries and affiliated companies in Brazil, Mexico, Argentina, Venezuela, Colombia, and other Latin American countries, leads the pay-TV category in technology, programming and service, delivering an unrivaled digital television experience to 12 million customers. DirecTV sports and entertainment properties include three Regional Sports Networks (Northwest, Rocky Mountain and Pittsburgh) as well as a 60 percent interest in Game Show Network. For the most up-to-date information on DirecTV, please visit www.DirecTV.com. What do you think? Are you sorry to hear that Damages is coming to an end? Have you been watching on DirecTV? Will you purchase the season four DVDs? Damages – going to miss it – watched the whole 5 seasons on netflix and really enjoyed it. Why do the good shows have to end so soon? Have been hooked since the 1st season; have purchased all four complete seasons on dvd. I am now trying to shop for a pre-ordering, if that’s possible on Damages the final season. Completely different genre than Game of Thrones, but it’s right up there in my personal opinion. I keep scheduling Damages on Wednesday via Directv, but have missed most of the final season, due to commitments. And, that upsets me, hopefully Directv will run a marathon on the final season of Damages, like in the past, on a weekend. Till a release date of the 5th season becomes available. Watched all episodes of Damages on Netflix . Best ever drama show, great writing .great acting. I am really going to miss this show. The best I have seen in many years. Keep alctraz… Bring it back on..!!!!!! I have been buying the episodes all of them as we do not have this show in the Netherlands. It is such a good show!!! I am looking forward to the new episodes but feel very sad it’s gonna end.